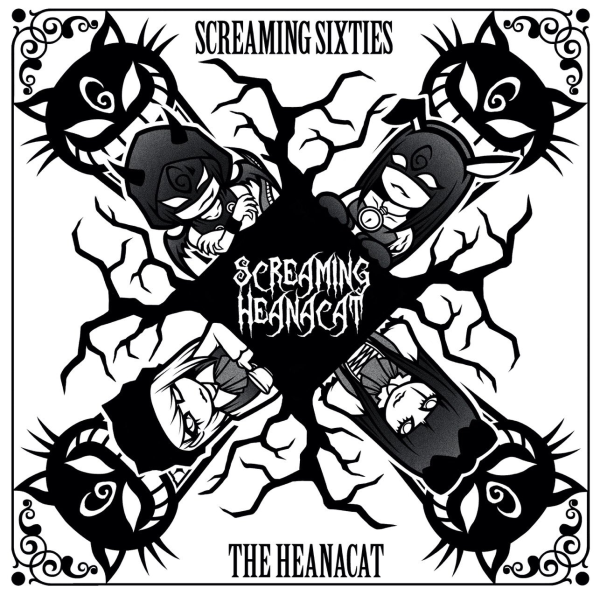 My thoughts on “Screaming Heanacat”, the collaboration mini-album between Screaming Sixties and THE HEANACAT. Another week and we’re another week closer to the Black Winds Over Albion UK tour featuring 2&, Screaming Sixties and NECRONOMIDOL. You can still get your tickets for the tour here by the way. Not only are we another week closer to this awesome tour but it also means that it’s time for me to review another recent release by one of the acts appearing on said tour. I hope you guys found my last review of 2&’s “Koboreochi / Resu” interesting and maybe it got you a bit more excited to see Saki perform in a few weeks. Let’s try and build on that excitement again this week shall we? Well, I’ve already reviewed Saki’s most recent release so why not now turn my attention to Screaming Sixties/Zekkyou Suru 60do. They kinda go by both names but I’ll probably just call them Sixties for brevity’s sake. Anyway, for their most recent release Kai and Montero teamed up with Rock duo THE HEANACAT for the very aptly named mini-album “Screaming Heanacat”. The last few releases from the Sixties have been collaborations with bands actually, which I think is a pretty cool way of doing things. With each new team-up being able to bring something new to the table while still functioning as a cohesive discography. I’ll be honest, I’m not in the least bit familiar with THE HEANACAT (who won’t be joining the Sixties in the UK unfortunately) but hey I’m always up for learning about new musical acts. I’m much more familiar with the Screaming Sixties though and have definitely enjoyed their take on the Idol Rock genre in the past. Their DIY ethos and insane work ethic (they play like 300 shows a year) are also very admirable as is their ability to perform with a variety of other musicians on any given show. Screaming Sixties say that the only proper way to experience them is live (go buy your tickets, seriously), but I’ll try my best to do them justice with this review here. The mini-album opens with “Gokiburi”, or “Cockroach” to give the word’s English translation…how delightful. Okay maybe not, but what is actually rather delightful is the kinda Iron Maiden inspired opening instrumental to this song. Maybe it’s just me who thought of Maiden, let me know. This all of course leads into Kai and Montero’s tandem vocals, which if you’ve listened to Sixties before you should know what to expect. If you haven’t, know that while they save the flashier stuff for special occasions, you’re always going to get a solid Rock vocal performance when these two are involved. I’m rather underselling “Gokiburi” by mentioning that though as I really do like this song a lot. It’s one of those ones that maybe doesn’t grab you the first time you hear it but before long you find yourself subconsciously humming the chorus to yourself. That’s what happened to me at least, which usually means the song in question is pretty good. Off to a nice start and using this song to promote the release feels like a smart choice to me. If you like it then chances are you’ll like what’s to follow. We keep the theme of Maiden-era Rock instrumentals for second track “Haru Natsu Akito” as well, so I really hope my analysis is correct or I’m going to sound really stupid. Also of note on the production side of things is where the vocals sit in the mix on this, and most of the other songs on this release. They’re a bit lower than a lot of Idol songs you may be used to so no, you don’t have a bad copy and your headphones aren’t broken…this is just mixed more like a band would do. I feel like “Haru Natsu Akito” takes several cues from “Gokiburi” and cranks them up a few notches. It feels like a bigger, more anthemic song is what I’m trying to say I guess. Vocally things are similarly paced during the verses but then the chorus hits and you really sit up and take notice. Remember when I said the Sixties save the flashier stuff? Well they brought it out on this song, that’s for sure. The notes both hit and held during the chorus should catch the interest of just about anybody. I make that 2 for 2 on great songs so far, what about you guys? Things get changed up a bit on third track “DAKARA?” with the introduction of some piano to take things more in a Piano Rock directions. If the thought of a piano doesn’t appeal to you for some reason, don’t worry as it’s pretty subtle and by no means in your face. I personally think it was a nice way of adding another dimension to the instrumental myself. There was also a couple of pretty cool guitar solos that I feel the need to mention, along with the continuing theme of really fun guitar riffs it all makes for a really cool instrumental. Vocally things are rather interesting to me as there’s more than a few points in this song where I found myself thinking “Hey! This part kinda sounds like something NECRONOMIDOL might do!”. This is made even more amusing given the fact that both groups will be touring together very soon. 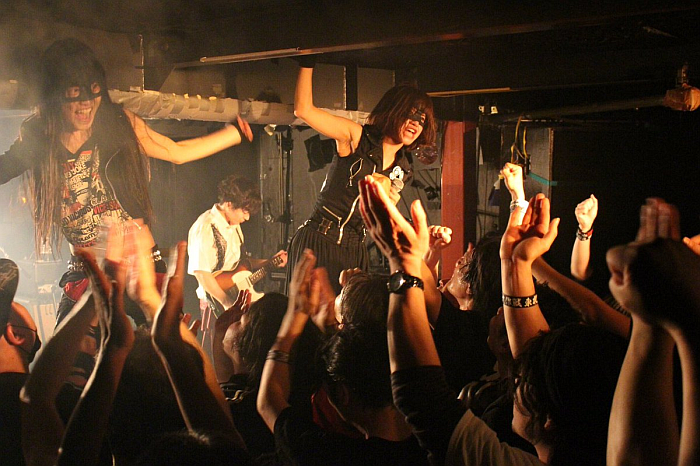 I guess if you’re a NECRONOMIDOL fan looking to check out their support acts then this might be a good song for you to test the waters with. I really like it too if that helps. The album’s fourth track “Shiawase, da” throws quite the curve ball into the mix as it’s in a style that we definitely haven’t heard up until now on this release and quite a different one at that. The Sixties and THE HEANACAT have done a Punk Rock song ladies and gentlemen, and you should all know by now how big of a fan of that particular genre I am. Granted they’ve gone with some pretty tried and true Punk riffs for the basis of the instrumental but far be it from me to pretend Punk songs have ever been these complex, grand arrangements in the first place. Vocally things have a much more lighthearted feel to them than on the previous 3 songs, which given the style of music is something that should be expected. The lyrics are also super catchy and should have no problem finding themselves lodged in your brain after a couple of listens. This is a very easy and more importantly fun song to listen to and if I had to pick, it’s probably my favorite from the mini-album. After that nice shot of fun in the arm, things get a lot more dark and brooding on the mini-album’s penultimate track “Yume, Gen wo Namaku”. I’m not sure why but I really like songs with creepy sounding instrumentals with that…galloping rhythm I suppose would be the best way to describe it. That’s what this song is for the most part, although it does feature one of the most ridiculously enjoyable and somehow not that out of place synthesizer melodies that I’ve heard in a good while here. It’s so great but totally unexpected when it first comes in. Maybe it’s just me and I have the upcoming UK tour on my mind far too much lately, but the vocals for this song once again sound like something you might hear out of NECRONOMIDOL. Come on, you can’t tell me that if you upped the pitch a little it wouldn’t sound uncannily similar. That’s once again in no way a bad thing by the way, just an observation. This is another song from this mini-album that’s very high in my estimations. The mini-album comes to a close with “Tsubu” and we are treated to a rather beautiful piano intro that does rather set the scene for what is to follow. Those of you wondering where the slower, emotive, Ballad style song on this release was going to come in now have your answer to that particular question. As you all know, these types of song aren’t exactly my cup of tea but the verses on this particular one have a haunting quality to them that I found myself really drawn to, and the raw emotion behind the delivery of the chorus was incredibly powerful. Also powerful were some of those notes being held and the overall control shown, another subtle display of just how talented the Sixties are in the vocal department. On the whole this is a very classy way to end things off and also gave us something that we hadn’t heard before too thus adding to the overall variety on offer. Good deal. I can already tell that this is going to be one of those releases that flies under a lot of peoples’ radars. It not being available on the usual digital platforms playing the biggest role in that. This is a shame as I can easily see this being one of the stronger Idol releases of 2018. Hopefully these UK shows will earn the Sixties at least a few new fans, they certainly deserve it. Speaking of which, all you guys reading this who are going to the Black Winds Over Albion UK tour featuring 2&, Screaming Sixties and NECRONOMIDOL better show up early to not only support the Sixties but also 2& as well. Tickets are still available from See Tickets so go get yours today! Also start practicing your squats and press-ups, you’ll thank me later!